NOTE: If you choose Cash/Check Registration, you will fill out your information online, print out your confirmation and Mail your print out in with your payment. Online registration is closed. 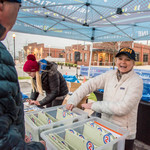 You can still register on site at the race. There will be NO refunds for 2019 races. Up to 30 days prior to the event your entry can be transferred to the next year. Your Feedback is very important to us. If you have any questions or comments please contact us.